Each antibody-antigen interaction has unique characteristics. A protocol giving good results for one antibody-antigen pair might found to be unsatisfactory for a second antibody even on the same sample. 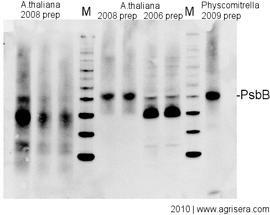 The interaction of antisera with protein epitopes in Western blot dependens upon a number of factors, all contributing to the final signal/noise ratio. Knowledge and control of those factors allows for modifications and optimization of the procedure. Polyclonal antibodies (serum or IgY-fractions from egg yolk) usually contain a number of different antibodies interacting independently with different epitopes on the target used for immunization. This number is limited for peptide-antigens but if recombinant or native proteins have been used for immunization the signal obtained has to be regarded as cumulative (=caused by several different types of antibodies present in the serum/IgY used). To achieve reproducible results the usage of gloves, forceps, clean and detergent-free laboratory materials, reagents which did not pass expiry date, freshly prepared buffers with controlled pH, as well as keeping protocol volumes, dilutions, and times is of primary importance in addition to the steps discussed below. In general, incubation times should be as short as possible while antibody dilutions should be as high as possible. This page includes a two part video tutorial - please scroll down. Careful control of presence of the target protein in the starting material, its preparation and storage under non-degrading/aggregating conditions is essential. If the target protein is degraded or not present in sufficient amounts in the loaded sample, it can result in lack of signal detection. 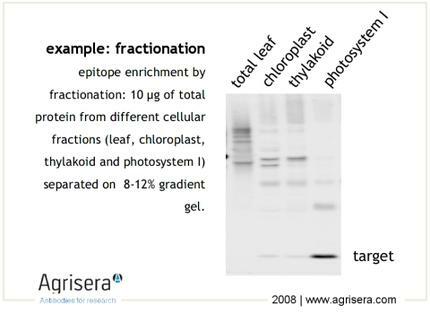 Epitope abundance can be enhanced under altered growth conditions, by selective tissue preparation, or fractionations of complex cellular extracts (i.e. organelle preparation). Sample quality is of crucial importance. As shown in the example below, in older samples of Arabidopsis thaliana total leaf preparations from year 2008 or 2006 protein of interest (in this example PsbB) has been degraded. M- molecular weight markers. 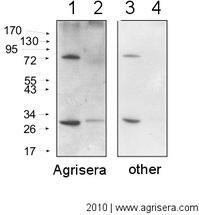 Secondary antibody used was Agrisera goat anti-rabbit HRP (1: 50 000) and ECL Advance detection system. Run sample buffer (+ loading buffer) in one lane of your gel to check for contribution of your sample extraction buffer to the background signal. Include positive and negative controls from the beginning: comparison of samples prepared from material containing no target (e.g. genetic 0-mutants) or higher amounts of the target (e.g. 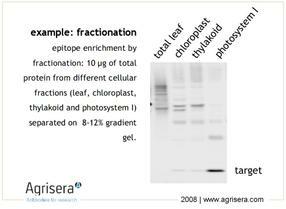 over-expression mutants) as well as cellular fractionation (e.g. organell preparation) will allow to control specificity of obtained signals. The size-related identification of a protein-antibody interaction usually requires gel separation under fully denaturing conditions. Complete reduction of intra- and intermolecular S-S bridges ensures the accessibility of the epitope for interaction with antibodies detecting linear epitopes. 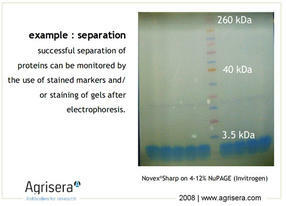 In this cases, reducing agents have to be added to sufficient final concentrations to both, sample and running buffer. If antibodies recognize non-linear eptiopes they require conformational integrity of the target best provided in non-denaturating PAGE systems or immuno-histochemistry applications. Increasing protein loadings might elevate epitope abundance but most often also promote non-specific cross-reactions, higher background, and impaired separation. Some highly hydrophobic membrane proteins might require 2-8 M urea in the gels and sample buffer to be kept unfold completely during separation. If DTT is used as reducing agent it should be freshly prepared. The protein transfer on a suitable membrane (blotting) with protein-binding capacity (nitrocellulose, PVDF) is highly dependent on the biochemical properties of the target protein. Proteins of higher molecular weight (apparent molecular masses of >100 kDa) require longer blotting times than smaller proteins. At low field strengths (<15 V/cm) the mobility of proteins out of the gel will be decreased and proteins will not be completely transferred from the gel. If field strength is too high (>35 V/cm) proteins might pass through the membrane without binding. The transfer time should be as short as possible to prevent proteins (especially lower molecular weight) from passing through the membrane. Place the second membrane and check how much signal is there after incubation with primary antibody compare to the first membrane. In gradient gels the porosity of the gel is matched with the size of the proteins what can be an advantage for efficient transfer. Check efficiency of a transfer by post-transfer staining of the gel (e.g. Coomassie or Silver) or the filter (Ponceau, reversible). Drying of a membrane (air dry between clean sheets of filter-paper) can improve immobilization of the protein. It is crucial that blotting equipment is well rinsed with destiled water after each use and is kept away from contaminating detergents. Foam pads should be cleaned and thoroughly washed. When your pads aquire colours (from plant material) and/or loose tension it is time to change them. The presence of SDS (0.01 to 0.02 %) in transfer buffer will increase the mobility of proteins (especially large proteins) out of the gel and provide a negative charge to the protein, which will help to maintain it in the soluble state. At the same time, SDS will reduce protein binding to the membrane (especially nitrocellulose) due to decreased hydrophobicity of the protein. The thickness of the gel is affecting protein mobility out of a gel. Thicker gels allow higher loading but lower molecular weight proteins might transfer less efficiently. To minimize background staining due to non-specific membrane-binding of the antibody tested, the membrane has to be saturated (“blocked”) with proteins which are not reacting with the antibody. Commonly used are low-fat dry milk powder, casein, or BSA, at 2-5% w/v. The shortest possible blocking-time should be determined experimentally for your system. Increasing the blocking-times unnecessarily (e.g. overnight) or incubation at low temperatures might lead to aggregation of blocking protein on the membrane and by this compromising later antibody-epitope interactions. If low background is obtained after 30-60 min of blocking any longer blocking will not improve your results. It should be determined experimentally if adding or omitting the blocking reagent in the subsequent antibody incubation steps is improving the results. Usually the buffer and the detergent concentration used should not abolish interaction of the blocking-protein with the membrane. However, accessibility of a target protein for primary antibody can be increased by a short wash using a wash buffer without blocking protein, performed before incubation with primary antibody. As some IgY antibodies might recognize milk proteins BSA might give lower background than milk powder in such cases. Do not use BSA as blocking agent if BSA-coupled peptides were used for immunization. If serum is used for blocking it should be considered if it can be excluded that the animal from which blocking serum has been obtained may have been exposed to and developed antibodies to the antigen in question. If this is the case, they may bind to the antigen and prevent binding of the primary antibody. 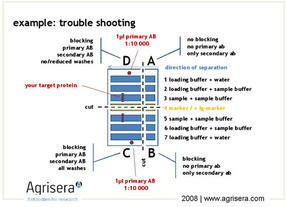 The primary antibody is the major determinant of the specificity of the target-recognition. The interaction with the primary epitope should be in favour over any cross-reactivity with other similar epitopes. Commonly used dilutions are between 1:500 to 1:20 000, depending upon the reactivity of the antibody used. To check for specificity of the target recognition you can use (1) another antibody against your target which will bind to other epitopes on a target protein, (2) control samples free or depleted of target-proteins, or (3) perform a peptide competition assay (for anti-peptide antibody). Lyophilized primary antibodies can be incubated for 2-4 h at 4º C after reconstitution prior to use. Storing primary antibodies (at 4°C or -20°C) in solution with blocking reagent for further use might result in decreased primary antibody activity. 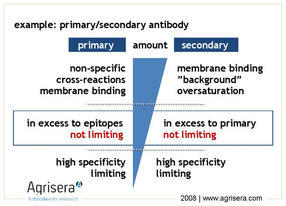 The secondary antibody has to be reactive against the primary antibody (e.g. use anti-rabbit to detect primary antibodies raised in rabbit) and usually is coupled to an enzyme or dye that allows subsequent visualization. Thus, any non-target binding of the secondary antibody will result in background (if bound to the membrane due to insufficient blocking) or false-positive recognition of non-target proteins present on the filter (“cross-reactions”). Usually secondary antibodies are used at dilutions of 1:20 000-1:500 000 depending on the sensitivity of the visualization method (e.g. enhanced chemi-luminenscense, ECL or alkaline phosphatase, AP). The optimal dilution of the secondary antibody has to be determined experimentally for the detection system used. Different secondary antibodies may even result in different recognition patterns when applied to the same sample. If an Ig-reactive marker has been used the signals obtained from the marker can serve as a control of the function of the secondary antibody as well as the subsequent visualization. 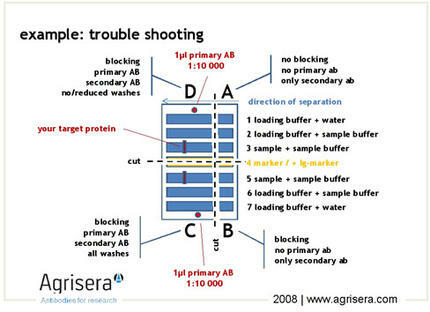 After all steps (4-6) excess off blocking-protein, primary or secondary antibody has to be diminished by washing. Usually same buffers as used for the preceeding steps are used. In some protocols washing steps include subsequent changes of the washing volumes with omitting the detergent in the last step. For reasons of reproducibility it is recommended to keep volumes and times constant. The intensity of washing steps can be elevated by (a) increased times and volumes, (b) additional changes of buffer, (c) higher detergent concentrations, (4) use of stronger detergents (e.g. SDS instead of Tween-20). membranes (nitrocellulose or PVDF) can be stored after western blot has been completed for up to 6 months in room temperature between sheets of Clinex. 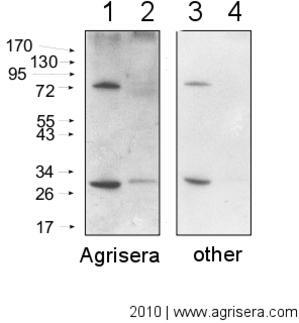 Total protein is isolated in 1x PEB buffer prepared freshly from 4x stock (AGRISERA, AS08 300) according to the protocol given in the product info on the Agrisera website. Protein amounts are determined using 1/5 of the volumes of the standard DC Protein assay (BIORAD) against a BGG standard dilution curve of 0.0, 0.2, 0.4, 0.6 and 0.8 mg/ml (plus a 0.5 mg/ml reference) prepared freshly from 2.0 mg/ml stock (PIERCE) in 1x PEB. Absorbances are red in triplicates against H2O. Variation of photometer readings should not exceed 5-10% and r2 of calculated standard curve should be > 0.995. Samples are stored aliquotted at -20ºC. Protein extracts in 1x PEB are prepared for loading in equal amounts and equal volumes (0.5-10 µg in 10-15 µl) with 1x NuPage LDS Sample Buffer (INVITROGEN) containing 50 mM DTT (added from freshly prepared 0.5 M stock within 30 min). Samples are incubated at 70ºC for 10 min, cooled down to RT, spun down shortly and loaded directly onto previously prepared gels. For each marker lane a mixture of 2 µl MagicMark (INVITROGEN) and 3 µl NovexSharp (INVITROGEN) is prepared in the volume equivalent to the sample volume containing 1x LDS sample buffer. The marker does not contain added DTT and is not heated prior to loading. After unpacking comb and lower slot strip are removed and the cassette is briefly rinsed in diH2O. All slots are individually spooled with 200 µl of 1x running buffer. Gels are inserted into the ShureLock Electrophoresis System (INVITROGEN) and outer buffer chamber is filled with 1x running buffer (MES or MOPS). Following a check for leakage, the inner gel chamber is filled with 1x buffer containing NuPage Antioxidant (INVITROGEN) according to the instructions of the manufacturer. 1x buffer is prepared freshly from 20x stock (INVITROGEN) with diH2O at RT. Samples are loaded using a Hamilton Syringe that is cleaned at least 3 times in 1x runnig buffer and passed over with a tissue of Clinex between loadings. Marker is loaded as last. Electrophoretic separation is performed at RT and 150 V until the front of the running buffer stain enters the lower cassette slot (ca. 60-70 min). Electrophoresis is stopped and cassettes are removed from the tank, opened by removing the shorter front plate and gels are either stained or taken for blotting. One filter paper is pre-wetted for some seconds in 1x NuPage transfer buffer and placed on the gel still attached to longer back-plate of the gel-cassette. The cassette is flipped upside down and the gel is deatached from the cassette with the tool supplied by the manufacturer (INVITROGEN) with filter paper side down to a parafilm strip. The membrane is pre-wetted for 1 min in 1x transfer buffer (for PVDF in addition pre-wet in 100% methanol for 1 min prior to that) and placed with exact fit onto the gel. The gel footer is cut off and the sandwich is completed with a filter paper (pre-wetted for some seconds in 1x NuPage transfer) buffer placed with exact fit on topside of the membrane. For each gel-sandwich 6 blotting pads are pre-wetted in 1x transfer buffer. 3 pads are placed in the cassette, the sandwich is positioned aligned to bottom of cassette and covered with the 3 other pads. The pads should now exceed ~0.5 cm over the border of the cassette. By attaching the lock pads a sandwiche is pressed and residual buffer can be poured of. While firmly holding the cassette appressed, it is inserted in the tank and finally locked with the clamp. 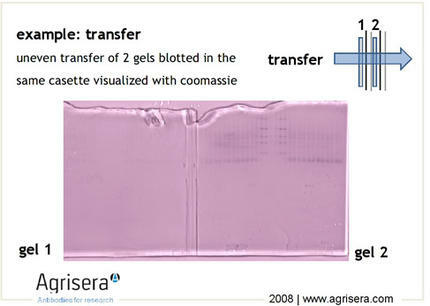 The casette (1 casette ~50 ml) is filled with 1x transfer buffer containing 1/1000 (v/v) NuPage antioxidant (INVITROGEN) not higher than to the top of the blotting pads. The tank is firmly knocked down 8-10 times to the table to remove air-bubbles and transfer buffer is added to the top of the blotting pads. The outer tank-chamber is filled with 4ºC or RT diH2O. The blotting is performed at 30 V for 1-2 hrs. Casettes are disassembled and the membrane is washed in diH2O for 2-3 min (shaker, RT). Gels may be stained subsequently to check transfer efficiency. The membrane is placed for drying, protein side up, between WHATMAN-paper. Membranes may be stored at RT in the dark for up to 3 month (or even 1 year). The membrane is blocked 1 hr with 2% low-fat milk powder in 1x TBS-T (20 mM Tris-Base, 137 mM NaCl, 0.1% TWEEN 20, pH 7.6). 1x TBS-T is freshly prepared from stocks of pH-adjusted (pH 7.6) 5x TBS and 10% (v/v) TWEEN 20. Blocking solution is discarded and each membrane is incubated for 1 hr with the desired dilution (1:500 to 1:50 000) of primary antibody in 10 ml of TBS-T containing 2% low-fat milk powder. After discharding the primary antibody solution the membrane is washed as follows: The membrane is first washed briefly once (5 s) and then for 15 min followed by 3 additional washings of 5 min in 1x TBS-T (without blocking agent). The volumes are at least 20 ml/step and should be kept constant. The membrane is incubated with the desired dilution of secondary antibody (1:10.000 to 1:100.000) in 10 ml of TBS-T containing 2% low-fat milk powder. After discharding the secondary antibody solution the membrane is washed as described above and incubated in 1x TBS-T pending signal detection. Activity of the HRP coupled to the secondary antibody is detected using the standard ECL (GE HEALTHCARE) or WestPico detection (PIERCE). regular ECL: From the stocks of solution A and B stored at 4ºC, 5 ml each are placed in seperate 10 ml falcon tubes and equilibrated to room temperature (10 min) in the dark. 1 min after both solutions have been mixed in the tray used for membrane incubation the membrane is fully submerged under gentle agitation for 60 s and placed onto tray used for CCD detection. WestPico (ECL): From the stocks of solutions A and B 1-1.5 ml are mixed in the tray used for incubation of the membrane by pipetting. Membranes are placed into the tray with protein-side up and mixed substrate solution is applied onto the membranes by pipetting for 1 min. Mebranes are then placed protein-side down into the tray for 4 min giving a total exposure time of 5 min before they are placed onto tray used for CCD detection. This is a very stable format for antibody storage. In -20°C or -70°C serum can be usually stored for years. In some specific cases this time can be shorter for anti-peptide antibodies. For very short time periods serum can be stored at + 4°C. In some cases more careful freezing with a first step at -20°C followed by -70°C can be beneficial. Generally antibodies in this format are stable. They can be stored in -20°C or -70°C for years. For short-term use some azide to the final concentration of 0.02 % can be added or other preservative. Purified IgY fraction is very stable. Even at room temperature (although we do not recommend it as storage conditions). IgY can be stored at + 4°C with 0.02 % sodium azide (note: azide inhibits activity HRP enzyme) or gentamicin sulfate (50 ug/ml). Avoid freezing and thawing of IgY or storing it on dry ice. IgY antibodies can be stored at -20°C. "The IgY preparations were stable over time. No loss of antigen recognition was observed after storage for 3 years at + 4°C. F.De Ceunick et al. Journal of Immunological Methods 252 (2001) 153-161. Antibodies in egg yolk should be stored at 4°C with 0.02 % sodium azide (note: azide inhibits activity HRP enzyme) or gentamicin sulfate (50 ug/ml). Egg yolk should NEVER be frozen as this will make difficulties for purification of antibodies. After 6 months of storage it might be more difficult to purify antibodies present in egg yolk. Mammalian, polyclonal antibodies can precipiate following affinity purification. This can happed directly afterwards or overnight during cold storage. Some antigens will stimulate a production of a class of IgG which is called a cryoglobulins, what means that they will precipitate in a cold. However, warming up to room temperature can solve this problem. Antibody solution can be also centrifuged to remove precipitates. Chicken antibodies can also precipitate when stored in the cold overnight or after several weeks. Warming up to room temperature often helps to dissolve those precipitates. Otherwise, IgY solution can be centrifuged to remove precipitation prior to use. Antibody solutions stored without preservatives are in risk to be contaminated by bacterial growth, which is often most common reason for protein inactivation. * For larger volumes of affinity purified antibodies, filter-sterilise antibody sample and aliquot to avoid multiple freezing and thawing. * Storage at protein concentration around 0.5-1 mg/ml. * In case of IgM especially check protein stability in different storage conditions. Important note: Sodium azide will inhibit horseradish peroxidase as well as interfere with some coupling methods and biological assays. However, the amount present in IgY preparation (0,02 %) can be washed away in ELISA or Western Blot when IgY is used as primary antibody at dilution at least 1:2000.